In Binali Yildirim (right), Turkish President Recep Tayyip Erdogan has found a prime minister enthusiastic about an all-powerful presidency. Although the current constitution grants him largely symbolic powers, Erdogan has acted as the effective head of the executive branch since he became Turkey's first elected president in August 2014. He has explicitly -- and, it appears, happily -- violated the constitution by acting as an absolute head of government. 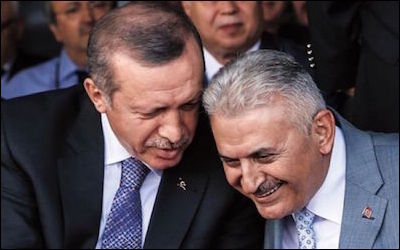 In May 2016, he forced Ahmet Davutoglu, his own confidant and prime minister, out of office; Erdogan evidently suspected that the man was not working hard enough to push for the absolute executive presidential system Erdogan has evidently been craving. Only seven months earlier, Davutoglu had won a parliamentary election with 49.5% of the national vote. The changes will make Erdogan simultaneously head of government, head of state, and head of the ruling party. Erdogan's "Turkish-style presidency" is already a presidency with too much power held by one man. If approved in the referendum, the changes will make Erdogan head of government, head of state and head of the ruling party -- all at the same time. Erdogan would have the power to appoint cabinet ministers without requiring a confidence vote from parliament, propose budgets and appoint more than half the members of the nation's highest judicial body. He would also have the power to dissolve parliament, impose states of emergency and issue decrees. Alarmingly, the proposed system lacks the safety mechanisms of checks and balances that exist in other countries such as the United States. It would transfer powers traditionally held by parliament to the presidency, thereby rendering the parliament merely a ceremonial, advisory body. 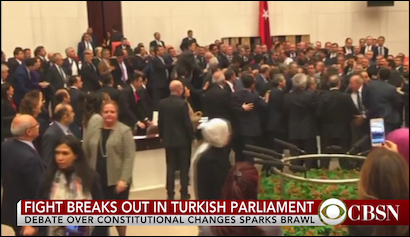 Several brawls recently broke out in Turkey's parliament during debate on a bill for constitutional amendments. In one instance, an independent female lawmaker handcuffed herself to the microphone on the lectern for an hour to protest the presidential bill. Deputies from the government benches tried to remove her, but opposition deputies sprang to her defense while punches and kicks were exchanged. The assembly saw its first-ever brawl between female lawmakers, who punched one another and pulled one another's hair. One female opposition deputy was thrown to the floor and her prosthetic artificial arm knocked off, injuring her severely. The proposed system makes parliament a largely ceremonial, advisory body. Even in the unlikely event of a win for the "no" campaign it will not be the end of the world for Erdogan. He would be bruised, perhaps badly. But he would play another card: a snap election. He would win new parliamentary elections and push for similar amendments, once again trying his chances. He would have nothing to lose. He appears to rely on popular support keeping him afloat. From a policy-making point of view, however, a "yes" or a "no" vote will not fundamentally change the dynamics under which Turkey is being ruled. At the moment, Erdogan is effectively the absolute ruler. If he wins the vote, he becomes actually the absolute ruler. If he loses, he remains effectively the absolute ruler until he tries again to become the absolute ruler.